With show-stopping mixability, enhanced flavor systems, and an array of ingredients in physiologically-relevant amounts, Scivation XTEND continues to outpace comparison. 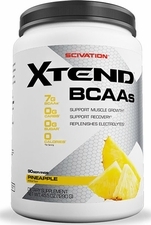 And as always Scivation XTEND is sugar-free and carbohydrate-free. Use Scivation XTEND, the original and most widely-used intra-workout product, to build muscle, burn fat, and to prolong the intensity of – and recovery from – your next workout. Directions: As a dietary supplement, mix one serving (one level scoop) of Scivation XTEND™ per 10 fluid ounces of water. Shake well and consume during exercise on training days or throughout the day on non-training days. Warnings: Keep out of reach of children. Always consult a physician prior to using any dietary supplements.